A New Genre for the Gospels? It’s not so unusual. And Imitation and Intertextuality? A necessity! Maybe it’s just me and the particular apologists I have encountered over the years, but I seem to have run into a claim that the authors of the canonical gospels found themselves moved to write about Jesus in a completely new literary genre that we call “the gospels”. The four gospels certainly are unlike other types of ancient historical and biographical writings from the Greco-Roman world, and many of us are well aware that a number of scholars have attempted to demonstrate that they nonetheless do conform to an ancient type of writing that approximates our understanding of biography, that is, a Life, or bios. We have argued here that such efforts are problematic and pointed out that not all scholars specializing in the genre of the gospels agree. So I found myself taking special interest when last week I came across classicist scholars pointing out that the creation of new genres, generally by mixing together into one composition the features of a range of pre-existing literary genres, was not at all so unusual in the literary world of the Greco-Roman culture throughout the second century b.c.e. through to the second century c.e. Further, on the question of intertextuality and “mimesis” or imitation and creatively re-writing lines and episodes from earlier well-known works may be thought of as the one constant, an essential skill for any Greco-Roman author, as we shall see. First, some from Elaine Fantham and her highly regarded work, Roman Literary Culture: From Cicero to Apuleius. Later generations continued the transfusion of genres (p. 94). It works for Esther. Why not for Jesus? One of the most frequently asked questions about the Book of Esther is: Are the events recounted in it true? In other words, is the book historically accurate? Arguing against the book’s historicity is the fact that many things in the story conflict with our knowledge about Persian history or are too fantastic to be believable. The following points are among the most obvious. We know of no Persian queen named Esther, or any Jewish queen of Persia, and we would not expect there to have been one. Queens came from the noble Persian families, not from ethnic minorities. Moreover, real kings don’t choose queens from beauty contests. 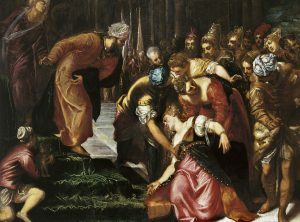 In fact, Esther enters the story more like a concubine, and only later emerges as a dignified queen. In contrast, Vashti, who was presumably a queen of proper ancestry and clearly in a high position at court, is treated like a concubine by Ahasuerus. While Ahasuerus has been equated with Xerxes, no Persian king acted or would act the way Ahasuerus did. He is a king who cannot make the smallest decision without legal consultation, and leaves the big decisions to others altogether. Any resemblance to a real Persian king is purely coincidental. A decree to annihilate the Jews is least at home in ancient Persia, an empire that is thought to have been relatively benevolent to the various ethnic groups within it, and is portrayed positively elsewhere in the Bible. This is the empire that permitted the Jews to return to Judah and rebuild the Temple, of which there is not a word in Esther. The plot hangs on at least one particular hook that goes against all logic but which is crucial to the story: that Esther could keep her Jewish identity hidden while all the world knew that she was related to Mordecai and all the world knew that Mordecai was a Jew. In contrast, those who defend the book’s historicity point to the authentic information about the Persian court and its many customs and institutions, and the use of a number of Persian terms. But it is not simply a matter of weighing one side’s proofs against the other side’s, for, when we look carefully at the points for and against historicity, it turns out that the historically authentic material is in the background and setting, while the main characters and the important elements in the plot are much farther removed from reality. If this were a modern work, we would call it a historical novel, or historical fiction. While those terms may not be appropriate for the Bible, we can certainly recognize Esther as a form of imaginative storytelling, not unlike Jonah and Daniel, or Judith and Tobit in the Apocrypha. In fact, such storytelling was common in the Persian and Hellenistic periods, and even Greek historians such as Herodotus, whose writings are given more credibility as history, include imaginative tales in their works. The distinction between history and story, which is such an important issue for us, would not have engaged readers in the Persian period in the same way it does us. To the ancient reader an imaginative story was just as worthy, or even as holy, as a historically accurate one, so to declare Esther to be imaginative does not in any way detract from its value; The message of the Book of Esther and the significance of Purim remain the same whether or not the events of the book were actual. Of course in the gospels some of the “too fantastic to be believable” points have been written out and replaced by scholarly inventions. The most obvious example is that Jesus in the gospels was crucified for no good reason (except for being very good and being the messiah); so the gospel truth is replaced by the more plausible notion that Jesus must have been crucified for as a political rebel. Pilate acts as unhistorically as does Ahasuerus. The ancient community of scholars attached to the Alexandrian Museum had a “religious character” since it was headed by a royally appointed priest and devoted to the service of the goddesses known as the Muses. This community produced the classical canon consisting of Homer, Hesiod, nine lyric poets, various playwrights and philosophers. Another collection of divinely inspired texts followed. What is noteworthy about this development of the classics or “canon” of Greek literature is the way in which it anticipates the similar development of the “canon” of the Hebrew Bible. It begins with Homer as the undisputed authoritative “canonical” work for all Greeks in the same way that the Pentateuch became the most important work for the Jews. To Homer and Hesiod, the great epics, the Alexandrians added other categories and works, but none drawn from their own time. They were all the great works of a past era. For the most part, the works were accepted as those of the first rank, without dispute, not only within the Hellenistic world, but especially by the Roman literati as well. . . . .
One important aspect of the so-called Alexandrian canon is the fact that it comprises lists of persons, epic and lyric poets, orators, historians, philosophers, and so on, along with their genuine written works and excluding the works that were spuriously attributed to them. Canonicity therefore entailed known authorship. Now a problem with most biblical literature is that it is anonymous. Yet it is precisely this impulse to follow the Hellenistic practice of creating an exclusive “canon,” a list of the classics of biblical literature that also came from the age of inspiration, that leads to the impulse to ascribe all of the works within this inspired corpus to individual authors: Moses, Joshua, Samuel, David, Solomon, and so on. Indeed, it is this notion of authorship that accounts, more than anything else, for the inclusion of some works, such as Song of Songs and Ecclesiastes, into this fixed corpus. Furthermore, there can be no canon, whether classical or biblical, without known authors, because anonymous works were undatable in antiquity; and if they could not be attributed to “inspired” persons from the age of inspiration, they had to be excluded. It may also be noted that most pseudepigraphic works were specifically attributed to “canonical” authors or the notables who belonged to that ancient period. It is a naive mistake to approach every ancient narrative that purports to be about past events on the assumption that we can take it at its word — unless and until proven wrong. Even the famous “father of history”, the Greek “historian” Herodotus, turned fables into history. The Hebrew Scriptures (Old Testament) does the same. If we are to understand how to interpret the New Testament literature we might find it useful to study ancient Hellenistic literature in general. Knowing how ancient authors worked across a wide spectrum of genres in the cultural milieu preceding and surrounding the time of the Gospels might lead to an understanding otherwise lost to us. If nothing else, a broad understanding of how ancient texts “worked” will alert us to possibilities that need to be considered and evaluated when we do read the Gospels. I focus in this post on Herodotus and draw out lessons from modern critical studies that might profit us in reading the Gospels and Acts, perhaps even the New Testament epistles. Since my previous post on looking at the preface to Acts in the context of contemporary prefaces, I have added a new section in that same post on the conventions of those prefaces. I have included it separately again here below.